Our cats have a few rules. No jumping on the counter tops, tables, the arm chair, or anything baby. That means no sleeping on the baby’s stuff- like the baby himself, his bouncy seat, or his rugs that we lay down in the floor during his playtime. As a result, our cats have become devious. Turbo is probably the most cunning and likes to test the boundaries. Since he knows he’s not allowed on Nathan’s play rug, he compensates by laying down right next to it. Literally. With no room to spare. 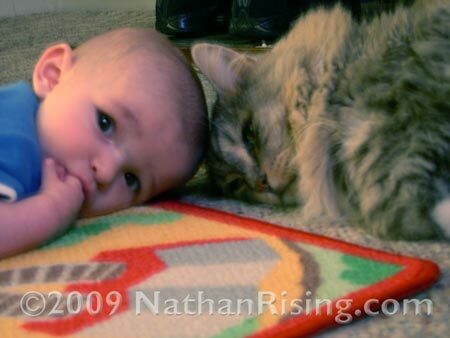 Here’s a close-up, just to reiterate how close he comes to laying on the rug without actually laying on it. Turbo was mad at me in this picture because I kept telling him the rug was a no-no, and he was all, dude can’t you tell I’m SO not on the rug? Nathan was playing happily, flopping and rolling around, running his hands over the designs and drooling over the colors. 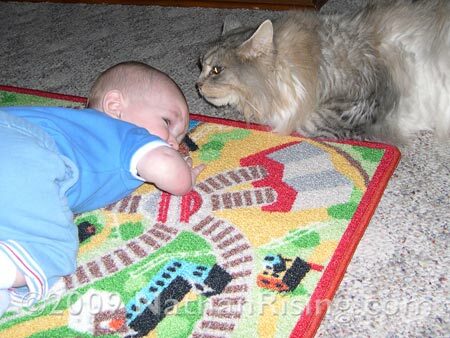 Eventually, his rolling and explorations led him right to Turbo’s inquiring nose. 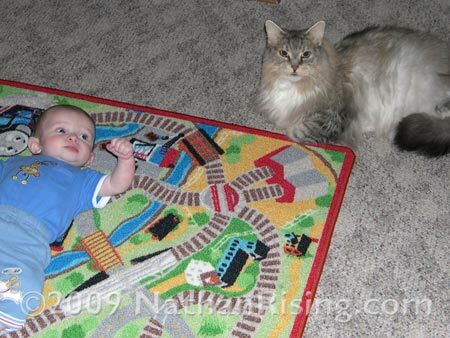 At first, Nathan was rather upset at this giant blocking his path. 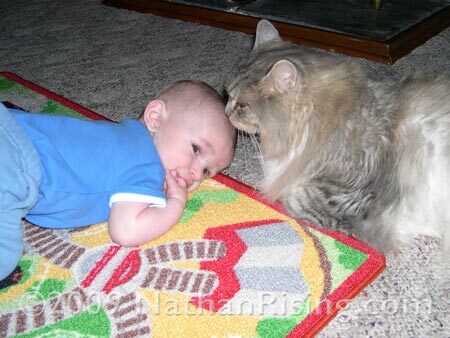 And Turbo wondered if Nathan would be edible, and if he was edible, would he taste like Friskies? 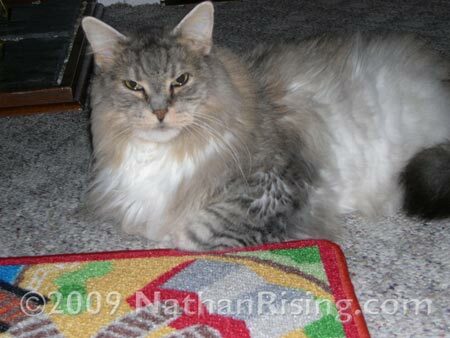 I informed Turbo that Nathan is not edible and he does not taste like Friskies. Turbo then decided if you can’t eat them, join them. Turbo quickly befriended the wiggling explorer. Here’s to friendship and not being eaten by giant cats..